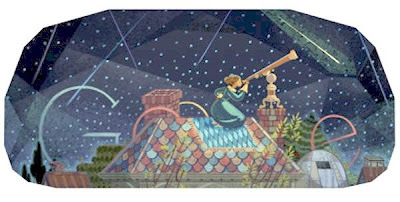 Maria Mitchell, the first female professional astronomer in the United States, became instantly famous in October 1847, when she was the first to discover and chart the orbit of a new comet, which became known as "Miss Mitchell's Comet." 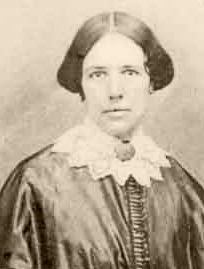 Maria Mitchell was born in 1818 in a large Quaker family on Nantucket. Her father was a schoolteacher, and later worked for a bank. The Mitchells encouraged education for all their children, even girls, which was unusual at the time. Astronomy was Mr. Mitchell's favorite subject. The family owned a small telescope, and all the children assisted their father with his observations. Maria, a quiet child, worked hard at her studies, especially astronomy, and enjoyed helping her father. She also enjoyed reading, as there were always many books in the house. As a young woman, Mitchell worked briefly as a schoolteacher, then as a librarian at the Nantucket Atheneum, while still continuing her astronomical observations. Her father encouraged her, and through him, Mitchell was fortunate to be able to meet some of the country's most prominent scientists, though generally as a young woman she was shy and avoided company. At the time, some comets had been found, but the discovery of a new one was still considered a significant achievement. King Frederick VI of Denmark had offered a prize for the discovery of each new comet. Every chance she got, even if the family had company, if the night was clear, Mitchell would go to the roof of the house to “sweep the heavens,” using the family's 2-inch reflecting telescope. On the evening of October 1, 1847, Mitchell slipped out of a party and went to the roof to begin her observations. She noticed a small blurry streak, invisible to the naked eye, but clear in the telescope, and she guessed at once that it might be a comet. Excited, she ran to tell her father. He wanted to announce the discovery right away, but she was more cautious. She recorded the object's position, and continued to observe it to be sure it was a comet. On October 3, Mitchell's father sent off a letter to Cambridge announcing the discovery. It turned out others had seen the comet at about the same time. Father de Vico at Rome observed the same comet on October 3, and several other people observed the same object shortly after that. However, Mitchell's priority was recognized, and she received the medal from the King of Denmark. This brought Mitchell immediate international fame, and further honors. In 1848, she was the first woman elected to membership in the American Academy of Arts and Sciences. She was also a fellow of the American Association for the Advancement of Science. Mitchell made many other astronomical observations during her career, including observations of sunspots, comets, nebulae, stars, solar eclipses, and the moons of Saturn and Jupiter. In 1865 Mitchell became a faculty member at Vassar College, making her the first female astronomy professor in the United States. She was also appointed director of Vassar College Observatory. With her students, Mitchell emphasized the importance of observation, and was known for asking them, “did you learn that from a book or did you observe it yourself?” Exemplifying this philosophy, she went to great lengths to observe things herself. In 1878, she and several students traveled two thousand miles to Colorado to witness a total solar eclipse. In addition to her scientific work, Mitchell was also active in opposing slavery and in advocating for women's rights. She believed that women's minds were too often wasted when they were forced to spend their time sewing rather than pursuing intellectual activities. Maria Mitchell died on June 28, 1889. Although she is relatively unknown today, perhaps because her scientific accomplishments may not seem as impressive to us as they did to her contemporaries, she was well-known and respected in her day. As the first American woman astronomer and an advocate for women, she paved the way for others. The Maria Mitchell Observatory on Nantucket is named after her, as is the Mitchell crater on the moon.